But here’s some good news! Ingredient awareness can help you break the cycle of disappointment. Today I’ll be focusing on a promising ingredient in the fight against wrinkles: adenosine. Research is ongoing into several potential uses of adenosine, based on its effects on viruses, the central nervous system, and hair growth. And, of course, skin. Adenosine may deliver some truly powerful benefits to skin. 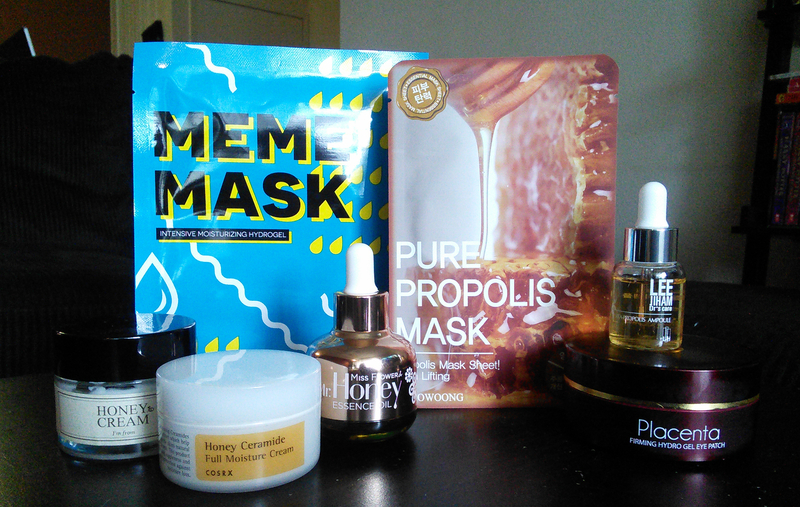 Memebox’s Meme Mask, Tosowoong’s Pure Propolis Mask, Leejiham Vita Propolis Ampoule, Berrisom Placenta Firming Hydro Gel Eye Patch, Banila Co. Miss Flower & Mr. Honey Essence Oil, and both of my honey creams contain adenosine. Even the most conservative reliable source (the Paula’s Choice Ingredient Dictionary) admits that adenosine has some skin-friendly functions. According to Paula’s Choice, adenosine is a cell-communicating ingredient with anti-irritant and anti-inflammatory effects. Additionally, adenosine supports healthy cell function, good news for anyone whose skin cells don’t seem to be functioning to their maximum potential. More interestingly, a 2006 study demonstrated the anti-wrinkle effects of adenosine. The study compared the application of adenosine-containing creams and dissolvable films (kind of like hydrogels!) against placebos and found that the adenosine-containing skin treatments significantly improved skin smoothness in the eye and mouth area, demonstrating “the potential beneficial effects of adenosine-containing products on crow’s feet and glabellar facial wrinkles.” My Google Scholar skills aren’t the best, but you can be sure I’ve got my eyes open for what other research I can find into the topic. Anecdotally, I’ve found that adenosine seems to be an effective component of my overall skincare approach. I’ve added a few adenosine-containing products to my skincare routine and am finally seeing progress in the beginnings of crow’s feet and the slight emerging problem areas around my mouth. In fact, in the last couple of days, I’ve seen some pretty noticeable firming–definitely enough to keep me interested. Adenosine seems to be found most often near the bottom of the ingredients lists in the products that contain it. It may be that the ingredient is too expensive to use economically at higher concentrations, or that high concentrations haven’t yet been shown by the research to be necessary. I do look for it to appear as high up as possible in a product’s overall formulation, but at this point, any is better than none. Have you tried any products with adenosine? What did you think of them? It may be in some of your products already. I was quite surprised by mine! I’ll have to have a look!! How does it appear in ingredients lists? As adenosine? Hi! the right dose of adenosine in products is of 0,4%, therefore you will only find it at the bottom of the ingredients’ s list: this is totally OK..
Reblogged this on Cupcake's Makeup Blog. I ran accross the same Google Scollar entry, and proceeded to dig deeper. I found it all quite interesting as Adenosine Triphosphate is our body’s life energy! In my line of work we utilizing ATP quite frequently so I was intrigued by this. After all my investigations I’ve begun incorporating Adenosine in my skin care routine, I’m hopeful to see results. However, it’s only been two months. What are your thoughts on EGF and/ or copper peptides?